A year after the Chandler townsite opened for official settlement in 1912, a new luxurious hotel opened. Dr. Chandler named the San Marcos Hotel for Fray Marcos de Niza, the first European to enter the Salt River Valley nearly 400 years earlier. The hotel opened with great fanfare, with Vice President Thomas Marshall in attendance, as well as prominent eastern and Californian businessmen. The hotel promised the most modern efficiencies, such as 1500 incandescent light bulbs, telephones in every room, and more than 3 miles of copper wire. When it opened in November 1913, the San Marcos hotel was the only electrified building in town. 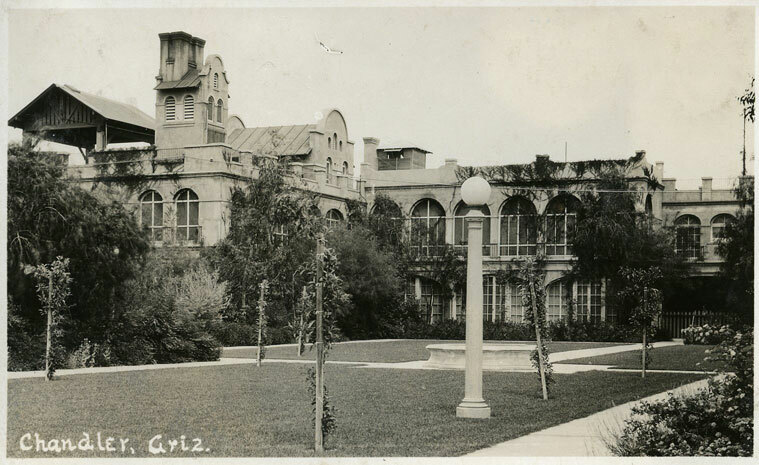 On March 28, 1913, the Chandler Arizonan suggested that the room phones could be used by guests to “sit in your room with a view of the green valley before your eyes while you are talking to snow-covered Chicago or shivering New York.” As it matured, the San Marcos, with its luxuries, became a favorite vacation spot of businessmen, celebrities and politicians from across the country. Guests could rent a room or ultimately a bungalow for the "winter season" to take advantage of activities, such as trips to Roosevelt Dam, horseback rides to the mountains, polo, and golf on Arizona’s first grass course. Through subsequent owners, like John Quarty, the San Marcos remained a popular tourist destination. Over its history, despite being shuttered for several years, the San Marcos Hotel has been, and continues to be, an important anchor for Chandler’s downtown business district. To see more photographs of the San Marcos Hotel, click HERE.